Friday, Day 2, of BEA was just incredible (and exhausting.) Amy and I woke up at 4:00 so we could get in line early for tickets for the author signings. It was still dark when we headed out to the Javits Center with Lenore (aka Presenting Lenore) around 5:15. It was only a matter of minutes before the skies opened up and it started pouring. Fortunately, I had my umbrella with me; however, I still managed to get soaked. I did learn a valuable lesson though -- do not wear cream pants or heels at BEA! Within a few minutes of arriving at the convention center, loads of fellow bloggers showed up -- it was like a mini blind date (Book Club Girl's words.) I can't express how excited I was to meet everyone; and, it's definitely true that everyone is exactly how you think they would be -- only better. I was especially excited to meet Kathy (aka Bermuda Onion.) Even though we had not met and have only corresponded via e-mail, blog comments and twitter, I consider her one of my best friends! After scoring tickets to some author signings, it was still only 6:30 so I had some time to kill before the Childrens Book and Author Breakfast which featured Julie Andrews, Meg Cabot, Tomie de Paola, and Amy Krouse Rosenthal. Amy and I had to wait in a huge line to attend the breakfast, and when we finally got into the room, they were out of some of the books like Meg Cabot's ALLIE FINKLE'S RULES FOR GIRLS BOOK 4: STAGE FRIGHT -- the only book I absolutely promised to bring home for Booking Daughter. One of the highlights of this breakfast for me was getting to see Julie Andrews. In addition, I loved listening to Meg Cabot -- she was a hoot to put it mildly; and it was kind of cool to hear Peter Yarrow sing Puff the Magic Dragon. After the breakfast, Amy and I tore out of there in search of some author signings. I intended on getting Julie Andrews' autograph first thing (I even had the ticket required); but when I saw the line, I changed my mind -- there was just too much to see and do at BEA. I did get to see her, though, when I was waiting in a nearby line, and she's just "lovely." CATCHING FIRE! -- Scholastic announced that they were giving away 100 ARCs of CATCHING FIRE by Suzanne Collins at 10:00 both Friday and Saturday morning. Amy and I decided not to wait in the long line since we had tickets to the author signing later in the day; however, we just happened to walk by and score our very own copies. Needless to say, we were kind of doing the happy dance! 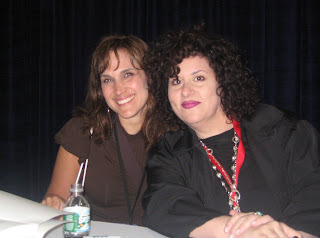 Adriana Trigiani --Ms. Trigiani is one of my all-time favorite authors and she was there signing ARCs of her new YA novel VIOLA IN REEL LIFE. As she approached the signing area, she stopped and talked to each person in line -- I even got a hug. She is just amazing and remembers everyone she meets. I think I embarrassed Amy a little because I was just so in awe of her! Emeril Lagasse -- I had a ticket to see Emeril Lagasse who was signing copies of his latest cookbook EMERIL AT THE GRILL. Since my husband loves to cook and grill, I thought I'd earn a few brownie points by getting the book inscribed to him with Emeril's autograph. In one of my finer moments, when I got up to meet him and he asked who to make the book out to, I said "Julie." It dawned on me right away and then I asked him to and my husband's name too. Can you say "star struck?" Anne Byrn "The Cake Doctor" -- I am a huge fan of The Cake Doctor cookbooks, and I was so excited actually meet Anne Byrn. She has a new cookbook coming out in the fall that looks gorgeous called THE CAKE MIX DOCTOR RETURNS which I know I'll be buying! I was fortunate enough to get the last signed copy of WHAT CAN I BRING? COOKBOOK, the only cookbook by her that I didn't already own. Books for Booking Daughter -- After not getting the Allie Finkle book in the morning, I was a little panicked because I didn't want to let Booking Daughter down. As I was complaining for the hundredth time that day, a woman in line for coffee gave me a copy of hers. I have no idea who she was, but I will be forever grateful to the kindness of this stranger! In addition to this book, I was also able to get a signed copy of the new American Girl book MEET REBECCA; and Katerine Paterson's book THE DAY OF THE PELICAN. I also brought some new middle-grade books for her too. She was so excited and is already reading her third book. At the end of Friday, Amy and I were scheduled to spend one hour at the Firebrand Booth signing autographs. We even had our own trading cards which were absolutely adorable -- they looked like baseball cards with all of our stats on the back like favorite books, blogs, etc. I was worried that no one would show up to see us, but I was happy that we had a pretty constant flow of people. Of course, the vast majority were bloggers that we already knew; however, there were a few people that we got to meet in person that we had only known through e-mails. This is also when Amy and I were interviewed by Publishers' Perspective. As tired as I was, the night was still young! I met my husband at the hotel, and we headed out for a nice dinner at McCormick and Schmicks. Then we took a cab to the Greenhouse for the BEA Tweetup Party. It was very loud and very crowded, but it was also a lot of fun! I loved getting to meet so many more bloggers, and I was so happy that Trish (aka Hey Lady!) won a Kindle. And that brings Day 2 at BEA to a close. I still feel like I'm leaving a lot of important stuff out, so please pipe in if I forgot something that should be here. Oh, I love the Cake Mix Doctor too! How exciting! My favorite is the cupcake version. I think cupcakes are the best invention ever - just enough cake, no need to slice or make a mess! Anyway, I'm very envious of your obviously awesome time, but so happy for you that it was so awesome! Oh, Julie, I'm so flattered by your kind words! I feel exactly the same way about you! For me the absolute best part of BEA was meeting so many other bloggers. I'm already looking forward to next year and driving my family crazy talking about it. Carl told me to invite my sister to go next year and I told him I can't because you and I are planning to room together! I forgot to say that I'm just a little bit jealous of your picture with Adriana. I am so glad you pointed her out so I could meet her too. I don't know how you managed to accomplish as much as you did in just 2 days. Amazing. This is a great recap! It was so nice of that woman to give you that copy of ALLIE FINKLE! I don't know what I adore more about this post. The fact that someone was so generous to give you a book they'd gotten from an author of Meg Cabot's caliber....or that you and your daughter have book club. I think that is most spectacular -- what a wonderful way to spend time with her. If I ever have kids I hope I can instill in them the love of reading that you've clearly given to your kids. I can't wait to borrow your newest cookbook! Also, I am so jealous that you got to meet Adriana Trigiani. She is one of my favorites. Great wrap-up! It was so great that Trish won the Kindle. What a great day! I had a great time chatting with you at BEA! I'm jealous that you got to meet Emeril. My MIL wanted me to get the book, but Serena and I didn't arrive in time. It was great to meet all of you and I love these wrap-up posts...I am at a loss of what to say! I missed Emeril and he is one of my all-time favorites...I love his restaurant in Vegas! Delmonico! It is to die for! Our early morning "shower" is one of my fondest memories - ha!